Located on 1,300 feet of the world's most beautiful beaches, you will find Long Beach Resort. With four 14 story towers, each living room, bedroom, and dining room overlooks the white sand beaches of the Gulf of Mexico. In true resort style, you will find multiple pools and whirlpools along with a poolside snack bar. At the end of the day, you can relax on your own private balcony while enjoying the tranquil breezes and gorgeous sunsets. With all of the fine finishes and amenities, Long Beach Resort is the perfect home away from home. 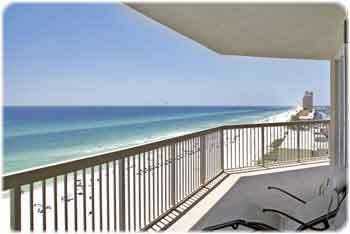 Hidden Dunes is a luxury condominium community nestled in Panama City Beach. It offers the conveniences of scenic Thomas Drive while providing privacy for 91 spacious condos. People choose Hidden Dunes condos partly for their upscale private accommodations. Each three-bedroom, three-bath condo measures 2300 square feet, has 9-foot ceilings, and boasts a 44-foot balcony with Gulf views and a hot tub. The spacious, airy layout is considered one of the best in Panama City Beach. Created on 26 March 2011 . Created on 10 September 2010 .